The marker was taken down and placed in storage in 2007, due to remodeling at the park. Here stood the original Spanish presidio or fort established as San Ignacio de Tubac after the Pima uprising of 1751. Captain Juan Bautista de Anza was in command in 1775, when he led his famous expedition to California to found San Francisco. 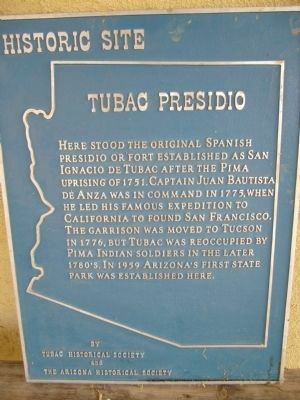 The garrison was moved to Tucson in 1776, but Tubac was reoccupied by Pima Indian soldiers in the later 1780's. In 1959 Arizona's first state park was established here. Erected by Tubac Historical Society and the Arizona Historical Society. Marker series. 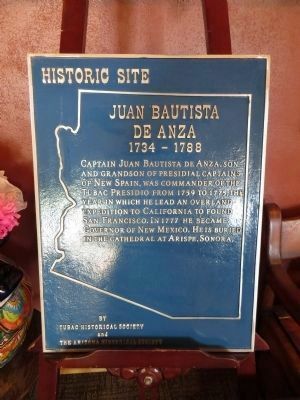 This marker is included in the Juan Bautista de Anza National Historic Trail marker series. Location. 31° 36.725′ N, 111° 2.787′ W. Marker is in Tubac, Arizona, in Santa Cruz County. Touch for map. Marker is in this post office area: Tubac AZ 85646, United States of America. Touch for directions. 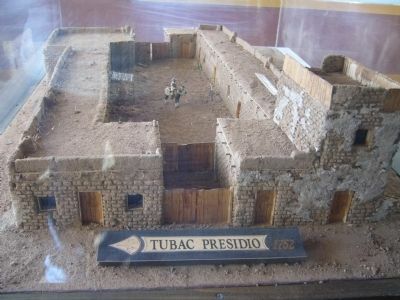 Diorama in visitor center at Tubac Presidio State Historic Park. Baca Float Number 3 (about 300 feet away, measured in a direct line); Charles Debrille Poston (about 400 feet away); Tubac (approx. 0.3 miles away); Mission San José de Tumacácori (approx. 3.1 miles away); Boy Scout Memorial (approx. 12.4 miles away). Touch for a list and map of all markers in Tubac. More about this marker. Marker is in storage at the Tubac Presidio Historic State Park. Regarding Tubac Presidio. Tubac Presidio State Historic Park is now operated by the Friends of the Tubac Presidio Park and Museum. The park is open 7 days a week from 9 am - 5 pm. This marker was just found by the Friends of the Tubac Presidio Park and Museum. They plan to erect it in front of the visitor center. More. Search the internet for Tubac Presidio. Credits. This page was last revised on June 16, 2016. This page originally submitted on February 3, 2010, by Bill Kirchner of Tucson, Arizona. This page has been viewed 1,155 times since then and 15 times this year. Last updated on August 23, 2013, by Bill Kirchner of Tucson, Arizona. Photos: 1, 2. submitted on February 3, 2010, by Bill Kirchner of Tucson, Arizona. 3. submitted on August 23, 2013, by Bill Kirchner of Tucson, Arizona. • Syd Whittle was the editor who published this page.